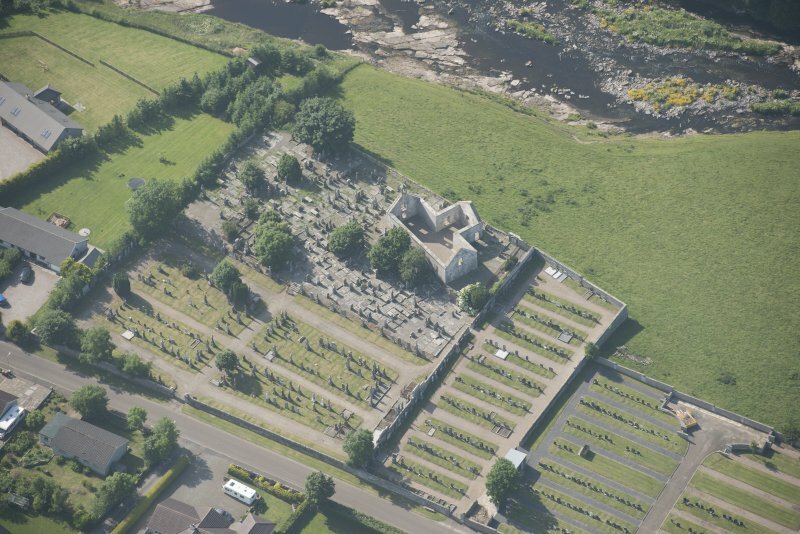 Oblique aerial view of Halkirk Old Parish Church, looking to the NW. The present parish church is built on the site of an old chapel, but no information can be had in this neighbourhood in connection with it. Part of the ruins were standing when the church was built. Halkirk church, built in 1753 and repaired in 1833, is a good example of a Georgian T-plan church, though it has been much altered internally and now appears to be quietly decaying. Abbey Church, now disused, is as described above. It has been superseded as a place of worship by the church at ND 1300 5942. No further information regarding the old chapel was found. Abbey Church, Halkirk. Georgian T-plan church built in 1753, repaired in 1833. Halkirk, Old Parish Church ND1352 5969.